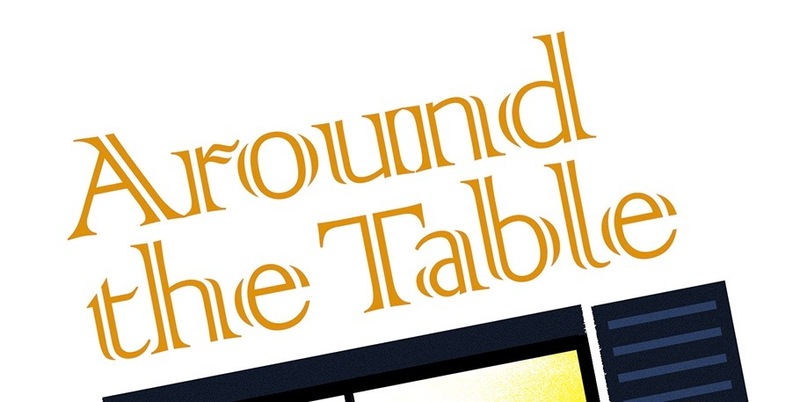 Around the Table Book: Do You Have a Burden? Do You Have a Burden? I do. I have a burden. I have something that weighs on me all the time. Something I would give up everything, and I do mean everything, to have resolved, because it's a burden of eternal consequence. I'm not so spiritual that I would find it easy to give up everything or that I wouldn't complain later or ask God give it back. But in my heart of hearts I understand that all I would be giving up is just temporary and the burden is about the forever soul of people I love. So I pray. I pray all day, many times a day, about this burden. We all like these verses because Jesus promises rest from our burdens. 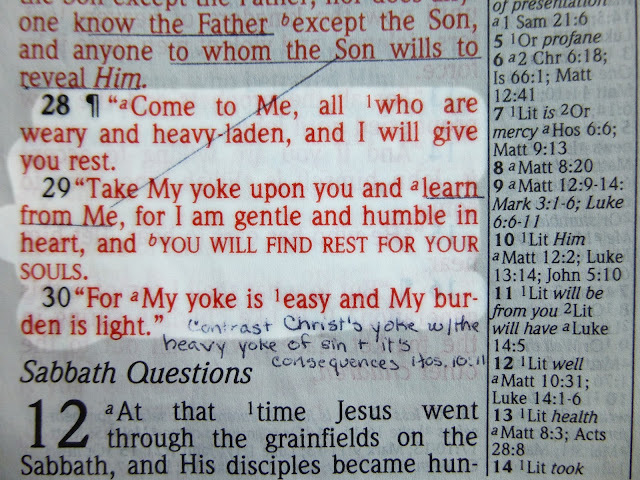 As I've thought through these verses (that's what that hard-to-understand "meditating" is), I have come to see that rest, isn't a do-nothing-vacation, or even freedom from our burden. 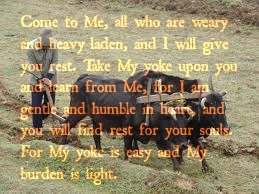 It is a two part rest: first, we rest by taking a yoke on us. We walk in step with Christ and that, obviously, will have us doing the right thing within the burden. By doing the right thing, responding as Christ would, we find a soul-rest even while carrying the burden. Second, it is a double yoke. We don't carry the burden alone; Christ is carrying it with us. He is teaching us, walking with us, making it doable. He's an easy teacher to have--gentle and humble. I remember a math teacher I had who was so haughty he made my sophomore year of high school miserable. One day when I was struggling with a concept he said to me, "I guess I'll be seeing you again next year!" He didn't. Although I eventually obtained a bachelor's degree from college, I did it without ever taking another math class! How wonderful to know that Jesus Christ will never exasperatedly say to me, "Haven't you gotten it yet?!" My personal devotions give me food for thought through out the day, and ways to pray for myself and others when they come to mind. They help me cast my burden on the Lord again. In talking with God about all that He is teaching me, doing in my life, and the things that concern me, I am strengthened for all I do, prepared for the day and all that will be contained in it. And part of what I do is plan, prepare, and share a meal with my family. I am convinced that my devotions help make our family mealtimes a more enjoyable place for everyone involved. Because I spend time with the Lord each morning, I hope I am more prepared to respond as He would want me to when the milk spills or a tough question comes up. I wish I could say I always carried His strength with me through the day to dinner. I'm afraid I haven't. But just imagine what I would have been like without that time with Him. I firmly believe that making a habit of personal devotions, and developing a life of devotion helps us make our family mealtimes a more inviting place to be and therefore, make it easier to get the family together for a meal. For Part 1 "A Well Stocked Kitchen" click here. If you find this blog helpful, would you please send a friend a link and consider posting a link in your social media? 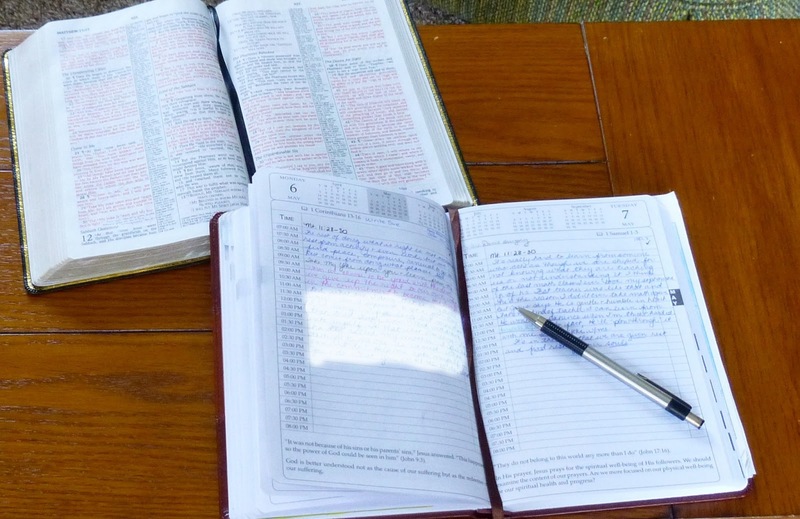 I pray this blog is a ministry, but to be a ministry, people have to know about and read it. Thanks!